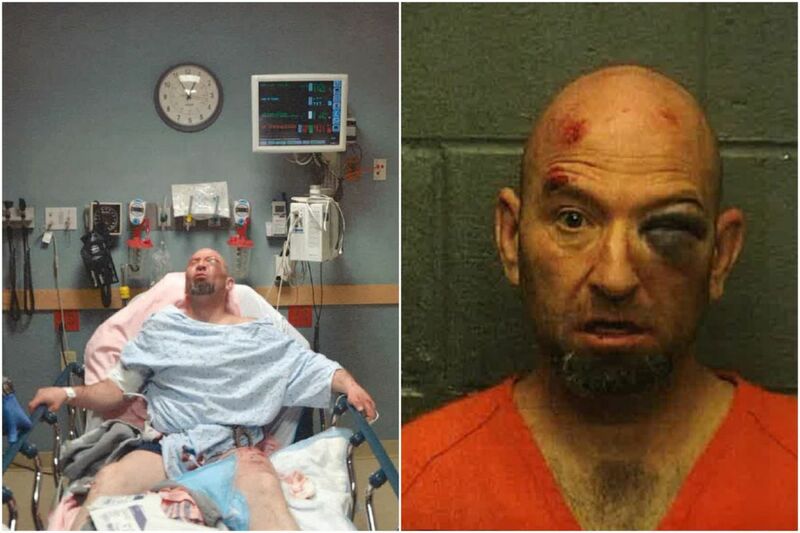 Steven Stadler at the hospital the night of his arrest, from March 13, 2013, and in his mugshot. This part isn't in dispute: On March 13, 2013, an encounter with three Atlantic City police officers and one K-9 officer, a German shepherd named Clancy, left a man named Steven Stadler in a bad state — his left eye black and swollen shut, assorted other head injuries, a series of bloody holes in his thigh from where Clancy sank in his teeth and held on, dragging him down the street. What led up to that — according to the 49-year-old Stadler, brutal police tactics and an administration willing to overlook them — is the subject of a civil trial that began Wednesday morning in U.S. District Court in Camden. Stadler, an addict who was attempting to break into a car-wash coin box when an off-duty officer first encountered him, contends that his wounds were incurred when police assaulted him and then unleashed the dog on him until he lost consciousness — all the while laughing and yelling, "Stop resisting!" The assault, Stadler maintains, continued even as he begged for mercy. His lawyers point to a long history of excessive-force complaints against Atlantic City police; they say the department's failure to train or discipline officers, and to keep the most aggressive officers off the K-9 unit, is to blame. Lawyers for the officers and the city, in opening arguments, noted that Stadler pleaded guilty to resisting arrest. "The plaintiff is going to want you to believe he encountered that police officer, it's over. 'You got me,' " Tracy Riley, a lawyer for the officers, told the jury in opening arguments. In fact, she claimed, Stadler, who had consumed Percocet, crack cocaine and large quantities of alcohol that day, had violently resisted arrest and police had used appropriate force required to restrain him. Atlantic City police receive training on use-of-force "not once, but multiple times per year," added Morrison Fairbarn, a lawyer brought in to represent the city. He said Devlin, the K-9 officer on the scene, gave three verbal warnings to Stadler before he unleashed the dog. The continued attack by the dog also was necessary in his recounting: "The K-9 is biting and pulling the plaintiff, and that still does not stop the plaintiff." Stadler, a resident of Ocean City, is represented by Jennifer Bonjean, who in September 2017 won a $3 million settlement for David Castellani Jr.; video from 2013 shows officers assaulting Castellani, 20, of Linwood after a verbal altercation, kicking and punching him as he huddled on the ground and then allowing a police dog to repeatedly bite him. The ordeal recounted by Stadler, the first witness in a trial expected to take weeks, was strikingly similar. "They were punching me, kicking me and hitting me. My head was bouncing off the concrete," Stadler testified, insisting he was complying with orders when he was attacked. "When I came to, my hands were cuffed in front of me and a dog was wrapped around my leg." At the hospital, he claimed, officers snapped photos of his wounds. "They were laughing and high-fiving." His lawyers will attempt to demonstrate a pattern of misconduct they say has gone unchecked for years. In court filings, they noted the officers had 38 excessive-force or domestic-violence complaints against them, over the last 10 years. Not one was sustained. They also cited the case of Justin Millet, a man who had been drunk and disorderly outside the Tropicana Casino. They said Internal Affairs records showed Moore and Devlin had chased the man into a parking garage where he fell to his death. And they cite the numerous legal actions against Atlantic City officers, including other K-9 handlers. In one case, a former New Jersey deputy attorney general, Michael Troso, was awarded a $500,000 verdict in 2013, against the department and K-9 officer Sterling Wheaten, who Troso said assaulted him. "Atlantic City's Internal Affairs process is a sham. Rather than hold the officers accountable for their actions, it permits, covers up for and arguably encourages officers to routinely use force without fear of discipline," Ashley Cohen, a lawyer for Stadler, said. And though the department's policy states officers' excessive-force history should be considered before assigning them to K-9s, "Atlantic City routinely appoints its most aggressive officers to the K-9 unit."